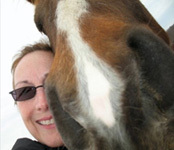 LEADMARE is the founder, publisher, and behind-the-scenes girl at Girls Horse Club. She has a successful history working for companies like Broderbund Software, The Learning Company and LeapFrog, where she developed fun, meaningful content and products for kids. When she’s not spending time with her human and animal family, working at her “day job” or running Girls Horse Club, LeadMare spends as much time as possible around horses by taking lessons, volunteering, and trail riding. JULIA, was the first ever Junior Blogger back in May 2007. After retiring from the roster in 2008 to focus on school, she continued to contribute as a reader and guest blogger. When she isn’t at the barn, chances are she’s either curled up with a good book or attempting to write one of her own. Julia spends a considerable amount of her life in the saddle and wouldn’t have it any other way. Since 2009, she has been contributing as a Junior Editor from her home in the USA. MADELAINA, became a Junior Editor in September 2009, in addition to being the Junior Blogger with the most seniority (April 2007 – January 2010). She has shared many inspiring blogs, poetry and stories with GHC readers, and is unwavering in her support for everyone. She also played an important role in our 2009 Fiction Competition by assisting the judges as a pre-reader. 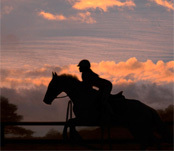 When she’s not reading or writing about horses, Madelaina takes riding lessons near her home in Australia. From May 2007 through January 2010, Girls Horse Club offered a Junior Blogger (JB) program that challenged young writers to do their best and rewarded them by providing professional editing, illustration and formatting of their work, and showcasing them as featured bloggers. The program was discontinued in 2010, but we owe a HUGE thank you to the Junior Bloggers who contributed many great blogs for our readers to enjoy. JBs will always be an important part of the herd at Girls Horse Club!